A couple of weeks ago, I shared an experiment for dyeing yarn with food coloring. The results were interesting, but I decided the yarn didn’t have a cohesive, finished look. So, it’s back to the dye pot this week. Overdyeing can rescue failed dye experiments if you’re careful about which colors to choose. In the video I share tips for correcting color when possible, and a tip for what to do if you just can’t seem to get it right. Hint: the end result will go with everything! You can find detailed instructions for dyeing with food coloring in my previous post. 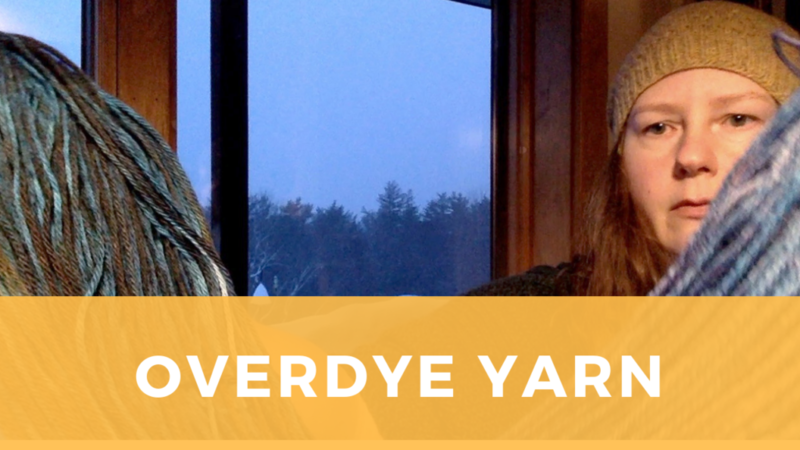 To overdye, follow the same steps for preparing your yarn and the dye bath. You may have to increase the acidity of the dye bath to get the dye to adhere well to the yarn. Also, if your skein just has one area that you want to change, you can try soaking just that section in the dye bath. 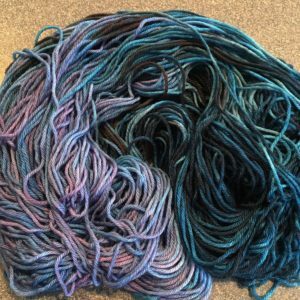 In this example, I started by soaking the pink section in the royal blue dye bath for about 20 minutes so that it would get most of the color, then added the rest of the skein to the dye and left it to soak overnight. The finished yarn retained a hint of pink, but has a more cohesive palette of blue and violet. Want to win this skein? I’ll be donating this overdyed yarn to an upcoming make-along from the host of the Quirky Monday Craftcast, Caleisha. You can find more information about this fun event in her episode titled: Shining, Literally.